Staff of East Anglia’s Children’s Hospices (EACH) and families supported by them had an early glimpse inside Norfolk’s new children’s hospice, the nook. The final tile was recently placed on the roof and, as is something of a tradition in construction, locally-brewed beer from Greene King was poured on the roof by EACH Chair of Trustees John Pickering, to signal the building is watertight. The ceremony took place on Thursday 29th November before guests went inside to see what progress has been made since building started a year ago. Parents of children who receive care from EACH signed steelwork as part of the tour. Graham Butland, EACH Chief Executive, said: “This is, clearly, a very exciting moment for the staff of EACH, the children and families we support, and the hundreds of individuals, businesses, trusts and community organisations who have contributed so generously to the nook appeal. The changing and more complex needs of the children and young people EACH cares for, and the increased demand for its service, means the charity has outgrown its current Norfolk hospice in Quidenham. The vastly improved facilities will mean EACH can reach even more than the 129 children and 160 family members it currently does from Quidenham, that supports an average of 45% more young people than each of the charity’s other two hospices in Cambridgeshire and Suffolk. to raise money call EACH’s Norfolk fundraising team on 01953 666767. 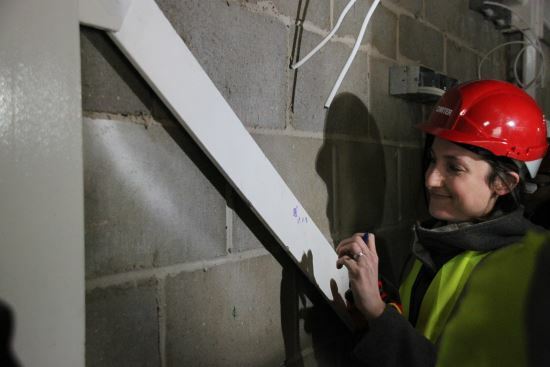 Pictured above, Carly Weeks, mum of Ava signing steelwork inside the nook.